Named one of the top rides in the country, The Michigander brings bicyclists of all ages on a tour of West Michigan's scenic trails, Great Lakes beaches, lighthouses, rivers, brewpubs, and more. Michigan is no stranger to cycling, and once a year dedicated cyclists focus their attention on one long distance event that defines the state. The Michigander Bicycle Tour, hosted by the Michigan Trails & Greenways Alliance (MTGA), will this year celebrate its 25th anniversary. A multi-day tour that ranks among the top 10 in the nation, according to Bicycling Magazine, the Michigander celebrates Michigan's varied landscape and the dedicated and fun-loving cyclists that give the sport a home on the state's trails. Taking place along West Michigan's Gold Coast, the region is excited to showcase this year's theme of "bikes, brews and beaches" from July 16-23. "It's just a very fun ride," says Roger Tuuk, West Michigan Trails and Greenways Coalition (WMTGC) board member and seven-time Michigander cyclist. With three options—a two-day, six-day and eight-day tour (a combination of the two- and six-day tours)—the multi-day tours provides an option for most skill levels. "Anybody can do it," says Tuuk, adding that some parents even hitch up bicycle trailers and take their children along for the ride. "People can go at their own pace," says Tuuk, which, for him, is about a leisurely 10 to 12 miles per hour. Staggered starts each morning make this possible, and encourage everyone to feel comfortable and capable of completing the day's ride. The perks of the ride also help, with daily dinner and breakfast provided with your entry fee, in addition to hot showers, gourmet coffee, water and snacks, baggage transport, yoga, stretching and even nightly entertainment. WMTGC, who hosts this year's tour, has even set up room blocks at hotels and b&b's near the route so that participants can easily ride or shuttle to and from camp each morning and night. With an average of 700 cyclists participating each year, and the tour topping over 1,000 riders a few years back, the Michigander has attracted some serious attention. But this was not always the case. In the first few years of the tour, cycling was not nearly as popular, most of Michigan's trails were undeveloped and mountain biking in particular was only just taking off. Thus, a multi-day tour such as the Michigander was "seen as a more challenging, strenuous adventure," says Nancy Krupiarz, executive director of the MTGA. Nancy KrupiarzBack then, the majority of the Michigander's participants were younger cyclists who were up for a previously untamed challenge. However, over the years, interest in the tour grew, slowly increasing to welcome cyclists of a variety of ages and skill levels. The trails have also changed, becoming more developed, and increasing in ease and accessibility. Now, baby boomers who have participated in the tour since its inception can easily participate in the event's 25th year. "This year it's mostly paved," says Krupiarz. As cyclists prepare to embark on the tour in West Michigan and on its Gold Coast, they can look forward to a series of highly-developed trails in the region. With mostly paved routes, except for one section of packed dirt road for less than a mile, "it should be one of the smoothest routes we've had in 25 years," says Krupiarz. 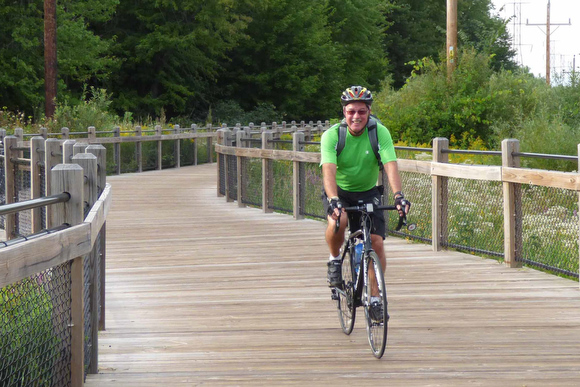 "West Michigan has one of the most interconnected trail networks in the state. This is a chance to really explore how those trails have come along," she adds. The location, once again in West Michigan after the last occurrence in 2012, is what has veteran participants like Tuuk excited for this year's tour. "Michigan is the number one trail state in the country," he says. "[Trails] are just a great place to ride." 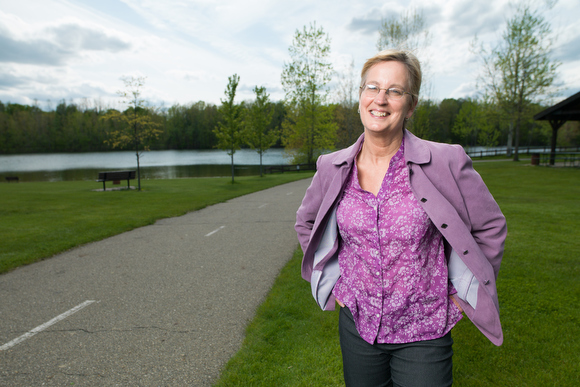 And with West Michigan leading the state in trail projects and development, this year's Michigander offers much to look forward to, including some fun fundraising events. On Tuesday, July 19, the MTGA will host a kayaking fundraiser in Newaygo. On Wednesday, July 20, the MTGA invites participants, fundraisers and friends to a West Michigan Whitecaps ballgame and dinner that will be dedicated to the Michigander's 25th anniversary. "Anybody is welcome to join us," says Krupiarz. New this year, the MTGA will also put on a Blue Star Trail wine tasting and soiree on Friday, July 22nd. All of these events are designed to compliment participants' entry fees to assist in providing the comprehensive support and amenities for cyclists along the trail. Most of all, the Michigander is a celebration of Michigan cycling and trails that highlights a particular region each year. This year setting up shop in our beloved West Michigan, the WMTGC and the MTGA will highlight Michigan's West coast scenery, beer culture and developed trails in an event that couples exercise with camaraderie. "It's a very fun adventure," says Tuuk. Interested in taking on the challenge? You can still sign up for the Michigander here.